This ceremony will take place on Saturday, September 22, 2010. On this day we will be visited by the Neteru - the life-forces of creation. We will be visited by the creators - Atum, Amen, Ptah - the cause of our existence; by the Elements Neteru - Ra, Nu, Shu, Geb, Nut - those who sustain us and creation; by the Principal Neteru - Auset, Ausar, Heru, Tehuti, Maat, Set and Het-Heru - those who guide us, and manifest through us, by way of speaking truth and doing good deeds. We will be visited by both houses of the Ennead, of both the higher and the lower house, consisting of the 42 Ntcheru who represent creation and the 42-laws of creation associated thereto. We will be visited by the Ancestors, the Seeds (those yet unborn) and other spirits of the community . The Neteru, the Ancestors and the Seeds all will assemble in the Hall of Justice to hear of the work of the Newly Transitioned; of their work on behalf of the forty-two laws of creation, civilization, culture, community and commitment. There, the heart of the ancestors will be weighed against order, balance, and justice, the standard of Maat, symbolized by the Feather of Truth, to determine if they have offended creation. If their heart balances the scale-of-justice and they have not offended creation they will become Ausar-Triumphant, after which he will be presented by Neter Heru to Neteru Ausar and Auset - at which time they shall transform into the image of Ausar - and thenceforth be known by this community as the Triumphant. In addition to the Ascension of the Honored Ancestors, the ceremony is for us as a village, as a community to say our collective farewell to them, to witness their ascension and to acknowledge and celebrate them as an Honored Ancestors. A way is being made for the Ancestors in the next world, as you would for a new-born coming into this world. Their Ba's (i.e. their souls) will travel between this and the next world to participate in their preparation - being introduced to those who will receive them, carrying forth their record of deeds, and situating their resting place. Between now and the time of the Ancestor Ascension Ceremony™ you and I have a roll to play in the final steps of the Ancestors journey on this plane: There are three rituals for us to perform between now and the Ascension Ceremony. The spirit of the Ancestors will travel among family, friends and community to share with you and to acknowledge their transition; you can, and should, call them to you during this time. You may meet them in your dreams, in your vision, on the street, in the likeness of another, etc. This is the time to complete with them everything that you must resolve. It is an opportunity to forgive them for any transgression or to ask for forgiveness of any transgression. Once forgiveness is given or received it is to be spoken of no more. This is also the time of mourning and remembrance where we individually and collectively write his epitaph in our hearts and minds. If you have organizations you should write and publish an epitaph of the Ancestor. A written epitaph will be presented at the Ascension Ceremony. a. Individually, or with family and friends pour libations to the Ntcheru and to the ancestors and tell them of the good work the Ancestors has done, including their impact in your life. Your word and their word will determine their fate as an ancestor. Ta-Nefer Ankh will convene a Ritual of Sending the Good Word Forward. b. This is a time of reciprocity, of Maat-Ka, or Ka-Maat, where we give in measure to what we received from the Ancestors. The Ascension Ceremony is created from the energy, time and resources given by the community to send them home. We need artist, artisans, dancers, poets, singers, drummers, designers, set-up and take-down people, and donations of money from everyone. Because this is a royal ceremony we want to send them home royally. This is the time for you to express your devotion, love and appreciation for creation and the upholders of creation that have come our way. c.	Attend the Ascension Ceremony of the Ancestors. Come dressed in white. In this sacred place we will enter a ceremony connecting us to our ancestors and to a tradition of more than 7,000 years. Brings gifts for the altar and for the Ancestors. d.	The ritual is a healing ritual, and is a good-time for those of us who are mourning loved ones to use this opportunity to resolve with them through the ritual and let them go forward as ancestors. At the Ascension Ceremony we will pour a libation to those who have not had such a ceremony to honor them. The Ancestor Ascension Ceremony™ is no small matter as we are visited with the earthly presence of the Ntcheru and deified Ancestors, and that we want to send the Ancestors home regally. The cost of producing this ceremony is in the thousands of dollars, however we are requesting each member of the community give $20.00 minimum, more if you can, towards the success of the ceremony. Remember, this is a time of reciprocity, that what you give is a reflection of what you think 0f creation, civilization, culture, community, committment, and the Ancestors and their work. (Take a look at the photo's from the Dr. John Chissell, Triumphant ceremony to get an idea of how large and royal this ceremony is. Do not think small, and please don't be small). A registry of donors will be presented to the Ascension Altar. Please give generously. We need participants, performers, artist, drummers, cooks, servers, set-up and take-down people and other support. Please contact us to lend a hand immediately for the time to create the ceremony is short; additionally support is taken on a first come basis. Having created this ceremony before we have had to turn away perfomers who offered too late. Don't be one of them. In addition, please share information about the Ancestor Ascension Ceremony™, with everyone; please foward the address of this website so that your family, friends and community may know. Please copy and desiminate the flyer as well. On the day of Ascension we want it to be said of the Ancestors as it was said in the Pyramid Text of Pharaoh Unis, this: There is no case involving the Ancestors on earth with their people, there is no guilty verdict of theirs in Amenta with the Ntcheru; for the Ancestor has removed the case involving them, and the Ancestor has destroyed the one against their ascending to the sky. "The righteous path has flown the Ancestors to Amenta to be among their brethren the Ntcheru. the Ancestor has acquired arms as a Nile goose, as Geb; the Ancestor has beaten wings as a kite, like Auset. A flier has flown, people: the Ancestor has flown away - Ascending toward the Sky"
The Ancestor Ascension Ceremony™ was part of a larger complex of rituals designed to benefit the departed (ancestors) leaders and caregivers of the society with resurrection, reincarnation, immortality and honor. The ceremony was practiced from the very beginning of Kemet society, as early as, five-thousand years ago (3,500 BCE), to throughout its history. After more than two thousand years of disconnect the ceremony has been recreated and performed in a modern context by Seba, Heru-Ka Anu. 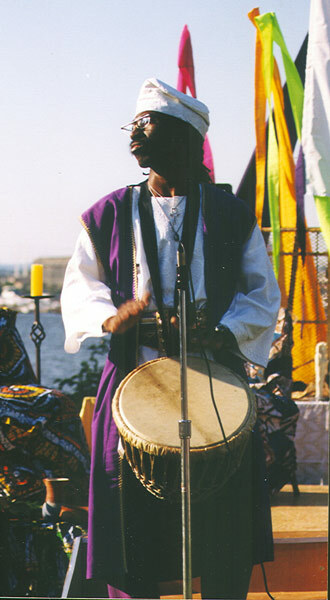 It was first performed in the year 2000 to honor Seba, Kwame Sabakhu Ra, Triumphant (aka Dr. Gerald Gantt), and again in 2004 to honor Dr. John Chissell, Triumphant. 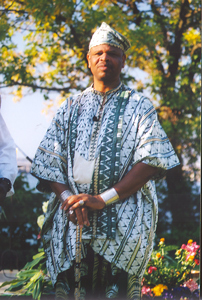 In its 'modern context' the ceremony is part of a larger project to repair the disconnect, to recreate and reconnect us, to the current of Africa Civilization via the path of Kemet Way - the Way of Life - of which Seba, Heru-Ka Anu is a principle leader and architect. The Ancestor Ascension Ceremony™ gives our community a formal method by which to elevate, honor and remember our departed leaders and caregivers forever. The Ancestor Ascension Ceremony™ identifies our elevated leaders and caregivers as either an 'Honored' ancestor or as a 'Deified' ancestor. 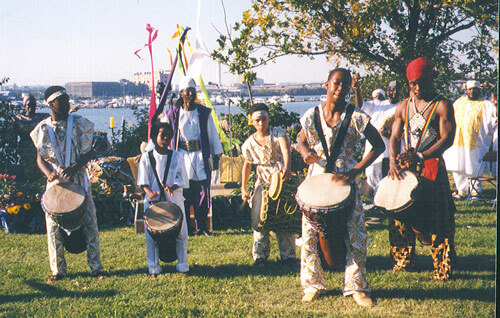 The ancestor is initially elevated to the status of an 'Honored' ancestor; however should the ancestor continue to grow in stature by his / her good works enduring and being embraced by an ever increasing number of people, over time, the ancestor is honored in a subsequent ceremony elevating him/her to the status of a Deified ancestor - a Ntcher. 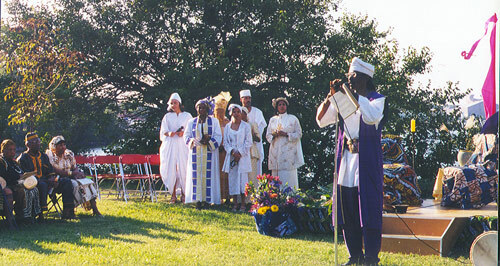 The Ancestor Ascension Ceremony™ is a complex of rituals that includes among others, 'Calling the Ntcheru' to convene together on earth before the community, to hear from the community, and to witness the ceremony of elevation before taking the Ka-Ba of the ancestor with them to Amenta - House of Amen (the highest house of the glorified). The ceremony also includes the 'Followers of Heru' ritual wherein the Ka-Ba's of loved-ones who've lived life in keeping with the Principal Ntcheru - Ausar, Auset, Maat, Heru, and Tehuti - are presented to the Ntcheru of both houses, the Upper and Lower Ennead. with whom they will then journey to dwell in the House of Ra where they will rise everyday as Khepra and shine each night as stars in the House of Nut. This ritual, the 'Followers of Heru' ritual benefits the entire community with healing by allowing us to release our departed to the status of an ancestor whereby we are able to continue our life-long relationship with them. The Ancestor Ascension Ceremony™ is a very beautiful and powerful ceremony and no one who walks the path of Maat should miss the opportunity to elevate and honor our leaders and caregivers, or to witness this great ceremony.